Kitchen renovation just got faster and more convenient, thanks to high-quality preassembled cabinets that are waiting for you now at The Home Depot. Overseeing a renovation job is similar in many ways to conducting an orchestra. If one section of the ensemble isn’t there to play its part, the show simply can’t go on. That’s why contractors appreciate the importance of setting—and keeping—work schedules. Besides the obvious inconvenience, even minor delays can end up being quite expensive. Ultimately, for the job to get done on budget and on time, all parties involved must uphold the initial project plan. If you’ve ever worked on a kitchen remodel, you know that stock cabinets can take weeks to be delivered, with custom work taking as long as six months. The variability here can be especially problematic because, in many kitchens, the cabinets must be delivered, built, and installed before a slew of other jobs can get under way—sink plumbing, for instance, or appliance installation. Coordinating a satisfactory timeline can therefore be, to put it mildly, a real challenge. To the rescue comes The Home Depot, which now enables you to sidestep the hassles cabinets so often introduce to kitchen remodeling. The Home Depot now stocks a wide variety of high-quality preassembled cabinetry. That means you no longer need to wait weeks for your cabinetry; on the contrary, those cabinets are now waiting for you at the nearest location. Do you prefer delivery? Products ship within as few as seven days. The Home Depot ships directly to the job site within a maximum of only 10 days. Once the cabinets arrive on-site, you can immediately begin installation without having to spend time scratching your head over the manufacturer’s instructions and proprietary tools or fasteners. Along with quick-ship availability, the time-saving convenience of preassembly means that cabinetwork no longer has to be a big question mark in your project plan. You know what to expect and may schedule accordingly. Kitchen remodeling has changed! Quick-ship assembled cabinets from The Home Depot come in a broad mix of styles, ranging from classic to ultracontemporary. Finish options abound, although if you wish to handle the staining or painting yourself, there are unfinished cabinets too. At $55 per linear foot (with large orders eligible for discounts), the price may be as appealing as the designs. 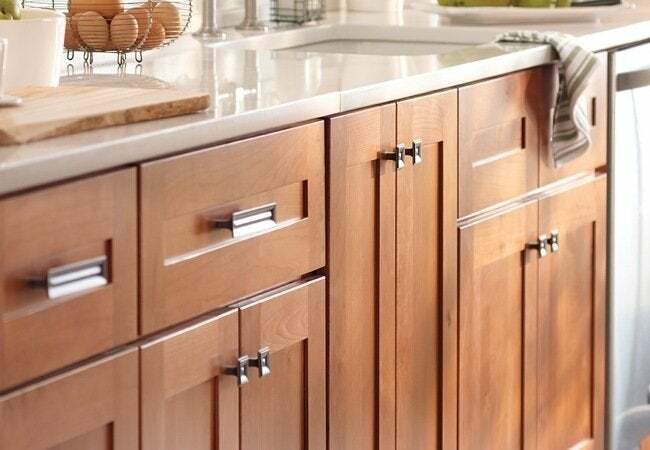 Scroll down to see only a few of the attractive cabinetry lines that are available right now. 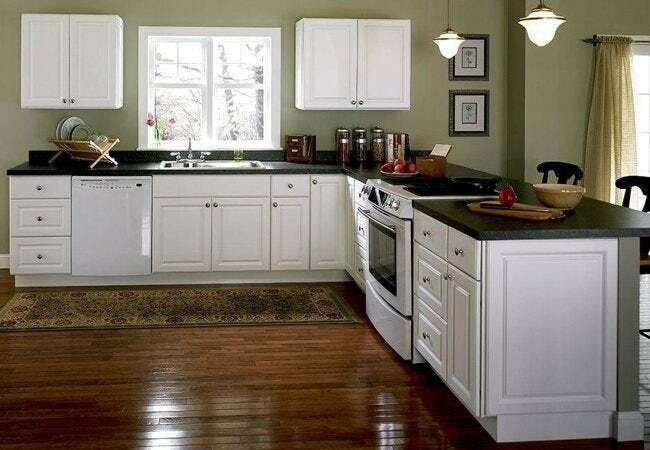 Low-cost and high-quality, the Hampton Bay line boasts classic raised-panel doors and a furniture-quality satin-white finish that lends a clean, crisp, and refined look to any kitchen. Three quarters of an inch thick, the interior shelves are robust and sturdy, and they’re also fully adjustable, allowing the homeowner to maximize, customize, and easily reconfigure storage space. Fully assembled, Hampton Bay cabinets come with a limited lifetime warranty. 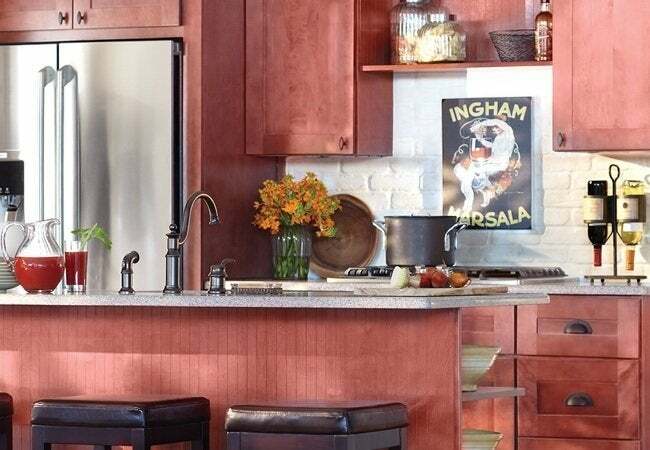 Inspired by timeless Shaker design, Hargrove cabinets offer a geometric flat-panel appeal balanced by an earthy cinnamon-color finish. With practicality to match its good looks, the line’s solid-wood doors open to reveal integral shelves and optional roll-out trays or wastebasket pullouts. With half-inch-thick plywood backings, Hargrove cabinets are rigid in construction and built to last. Perhaps best of all, like others from The Home Depot, these cabinets arrive fully assembled. With a reddish-brown cabernet finish, Kingsbridge cabinets and drawers feature durable all-plywood construction. Their full overlay doors, meanwhile, include three-inch-wide solid birch frames that surround recessed panels of birch-veneer medium density fiberboard (MDF). Enhanced by soft-close technology, those doors will provide smooth, quiet operation for years. In fact, the line carries a limited lifetime warranty—and yes, the cabinets arrive fully assembled! 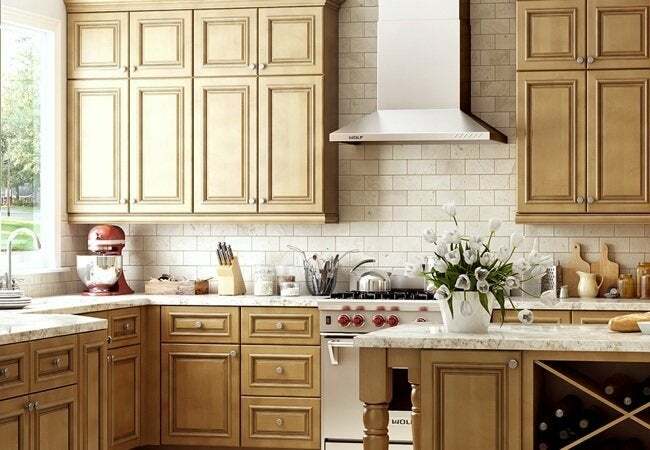 Restore reliable scheduling to your kitchen remodeling projects—and save valuable time on installation—by choosing from among the many lines of quick-ship assembled cabinets at The Home Depot. For more information, visit your local store or shop The Home Depot online for its full range of products.